1. Place smooth peanut butter, maple syrup and coconut cream in a medium bowl. Whisk with a wire whisk until you obtain a uniform mixture. Don’t panic if the mixture appears to seize halfway through, it happened to me on two occasions but more vigorous mixing recovered it. If mixing doesn’t help, add a tiny splash of water and whisk some more. 2. Place aquafaba in a clean (that’s very important as any grease residue will prevent the aquafaba from foaming) glass or metal bowl. Add vinegar (or lemon juice). Whip it until you achieve stiff peaks – you should be able to invert the bowl and the whipped aquafaba should not budge an inch. If it does it means that it hasn’t been whipped enough. 3. Fold stiff aquafaba into the peanut mixture with a clean spatula until the two are well incorporated. Do it very gently as you don’t want to knock too much air out while mixing. The mixture will deflate a fair bit, don’t worry, that’s normal. 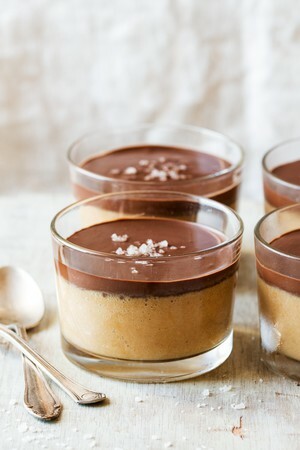 Pour the mixture between 4 small glasses and place them in the fridge for 8 hours (or overnight) for the mousse to set. 4. Once the mousse has had a chance to set, place the chopped up chocolate and almond milk in a bowl over a water bath. Set the hob on the lowest setting and allow the two to melt into each other. Do not stir until most of the chocolate has melted. Take off the heat and gently mix the two together with a wire whisk. 5. Allow the ganache to cool down before topping the peanut butter mousse with it. 6. Once the ganache is cool but still pourable, divide it evenly between the 4 ramekins and place them into the fridge (or freezer to speed things up) to set. Sprinkle the tops with coarse sea salt just before serving.